The Control Module performs the timing, sequencing, switching, and load shedding functions for the furnace/s and air conditioner fans and compressors. It is often located under the refrigerator. 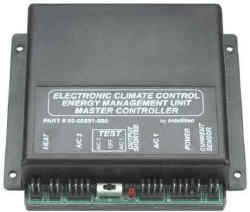 The circuitry in this module decodes the control signals sent to it via the multiplexed communication link from the ECC Thermostat.